Newbery honor winner, New York Times bestseller, Edgar Award Finalist, and E.B. White Read-Aloud Honor book. Rising sixth grader Miss Moses LoBeau lives in the small town of Tupelo Landing, NC, where everyone's business is fair game and no secret is sacred. She washed ashore in a hurricane eleven years ago, and she's been making waves ever since. Although Mo hopes someday to find her "upstream mother," she's found a home with the Colonel--a café owner with a forgotten past of his own--and Miss Lana, the fabulous café hostess. She will protect those she loves with every bit of her strong will and tough attitude. So when a lawman comes to town asking about a murder, Mo and her best friend, Dale Earnhardt Johnson III, set out to uncover the truth in hopes of saving the only family Mo has ever known. Full of wisdom, humour, and grit, this timeless yarn will melt the heart of even the sternest Yankee. 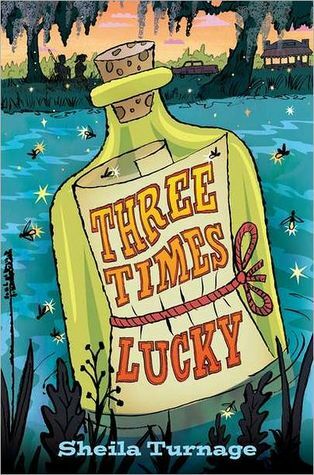 I chose this book for two reasons, one, I felt I had been lacking in the primary reading department, and two, it was a Newbery honor book. I had read and love the Newbery winner The One and Only Ivan, so when I saw this book at my library I happily took it home. The book is set in Tupelo Landing, North Carolina, population 148 minus 1 (murder) , a town full of eccentric characters. Moses, so named because she was found at the river’s edge during a hurricane 11 years earlier, is the centre of it all, and is front and centre when a local man is found murdered. Moses may not have any luck finding her Upstream Mother, but she’s sure that she and best friend Dale can find the murderer before Detective Starr and his associates. This book has a little of everything, the exchanges between Dale and Mo are laugh out loud funny, the dynamic between Mo, Miss Lana and the Colonel will tug on your heart strings, there’s a little romance with Mo’s crush on Lavender… and then there’s the murder mystery. I am not sure if 'the south' of today still use such niceties as are displayed in this book, the children refer to their elders as Miss Lana, Miss Rose and Grandmother Miss Lacy Thornton, but to this Aussie reader, that all adds to the charm of the story.